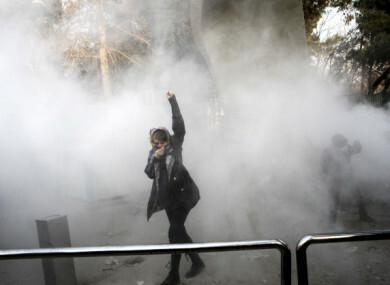 A university student attends a protest inside Tehran University earlier this week while a smoke grenade is thrown by anti-riot police. IRAN’S UNITED NATIONS ambassador has said that the UN Security Council’s meeting on widespread protests in his country is “a preposterous example” of “US bullying”. Ambassador Gholamali Khoshroo said today that “it is a discredit for the Security Council” to discuss what he called a purely domestic matter. He went on to list protests in the US, from the Occupy Wall Street movement in 2011 to demonstrations outside the 1968 Democratic National Convention. The US called the Security Council meeting after giving moral support to Iran’s anti-government protesters. US ambassador Nikki Haley said the session put Iran on notice that “the world will be watching” its actions. “The Iranian people are rising up in over 79 locations throughout the country,” Haley told the council. It is a powerful exhibition of brave people who have become so fed up with their oppressive government that they are willing to risk their lives in protest. Haley accused the government of funding a pro-regime military campaign in Syria, backing Shiite militias in Iraq and supporting a crony elite while ordinary Iranians struggle. Iran has also seen three days of large pro-government demonstrations. Earlier, Russia’s UN envoy says the United States is “abusing the platform of the Security Council” by calling an emergency meeting on the protests that have roiled Iran in recent days. Ambassador Vassily Nebenzia said the demonstrations are a domestic matter, not an international security issue warranting the attention of the UN’s most powerful body. “Let Iran deal with its own problems,” he said. Email “Iran says that meeting of UN Security Council over mass protests is 'a preposterous example of US bullying'”. Feedback on “Iran says that meeting of UN Security Council over mass protests is 'a preposterous example of US bullying'”.